M. to Th., 1:00 p.m.–9:00 p.m.
M. to Th., 8:00 a.m.–9:00 p.m. 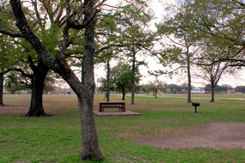 In August 1996, an interlocal agreement was signed between Harris County and the City of Houston regarding the operation of Burnett Bayland Park. A county property since 1971, it was turned over to the City for a 30-year period, during which HPARD will operate and maintain it. 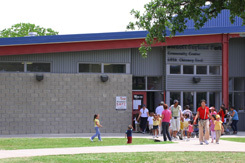 It is named for Ms. Mary Burnett-Bayland, founder of the Burnett-Bayland Home for Dependent Children. The park is part of a 67-acre gift to the orphanage made by Mr. Joseph Meyer on August 24, 1912. The rest of the county property is occupied by Harris County Precinct 3 Courthouse Annex, which shares a parking lot with the park. 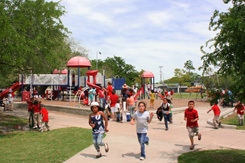 On May 13, 2000, a new water playground was opened to the public at Burnett Bayland Park. 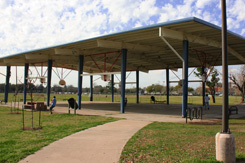 Other recreational facilities at the park are a play ground, a 0.96-mile long walking trail, a community garden, picnic tables, soccer and baseball fields, a basketball pavilion, and a community center.